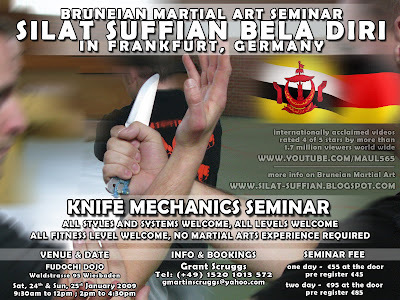 You are invited to attend a Silat Suffian Bela Diri Seminar. Open to all Martial Artist, styles and anyone who are interested. All levels welcome, All finess level welcome, No Martial Arts experience required. Price above are for per-person participating. If you are pre-registering 50% of non-refundable payment is needed. Save 10euro by pre-registering. SSBD Training Group members get 10% discount from pre-register fee. Pre-register dateline: Monday, 19th January 2009. Due to safety and legal reasons, DO NOT BRING ANY LIVE "SHARP" BLADES. Respecting other participants is a priority, do not do to others what you do not want to be done to yourself.